The emergence of new powers fundamentally questions the traditional views on international relations, multilateralism or security as a range of countries now competes for regional and global leadership – economically, politically, technologically and militarily. As the focus of international attention shifts from the Atlantic to the Pacific, the European states in particular are seen to lose influence relative to the emerging economic powerhouses of China, Russia, India and Brazil. European nations find themselves too small to engage meaningfully with these continent-sized powers and, in an increasingly multipolar world are concerned their influence can only continue to decline. This book analyses the shifts in the structure of global power and examines the threats and opportunities they bring to Europe. Leading European Contributors reflect on how the EU can utilise collective strength to engage and compete with rapidly developing nations. They examine perceptions of the EU among the emerging powers and the true meaning and nature of any strategic partnerships negotiated. Finally they explore the shape and structure of the international system in the 21st century and how the EU can contribute to and shape it. Thomas Renard and Sven Biscop (eds. 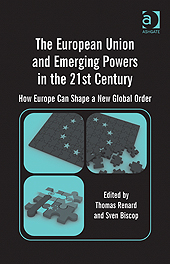 ), ‘The EU and emerging powers in the 21st century: how Europe can shape a new global order’, Ashgate, 2012.